Manchester United Rio Ferdinand continued his somewhat unsporting week by shoving Chelsea striker Fernando Torres in the back of the head in an off-the-ball incident during Manchester United's 2-2 draw with Chelsea in the FA Cup quarter-final. 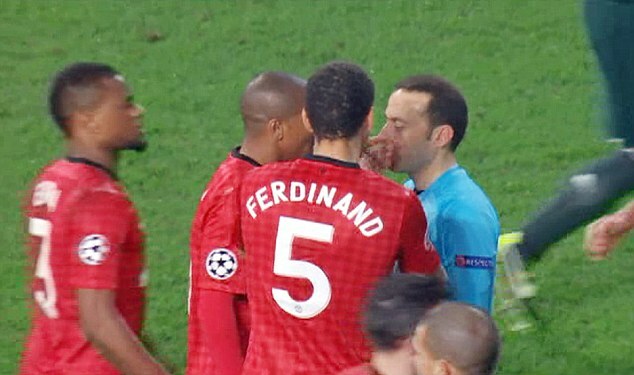 Ferdinand,who is said to get recall to coach Roy Hodgson's England squad, went in for a challenge with Torres and after the pair had got up, barged him with his forearm and kicked his achilles while the referee was looking the other way as the following pictures suggest. He has avoided censure from UEFA over the incident and the club also were not punished for not fulfilling their post-match media obligations.